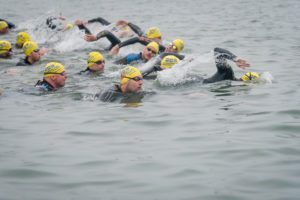 Spring represents hope for triathletes. The long Canadian winter is over, and summer is on its way. Shorter road races such as a 5K are perfect events to test your fitness and get you in the racing mindset. Karsten Madsen running at the Runner’s Den Pancake 5K in Scottsdale, Arizona. Training for a short road race takes less time than a half-marathon, and it means faster workouts that develop speed and strength. Also, having a race to train for before the triathlon season gives your training focus. Jessey the Elf ran the 5K at Around the Bay in 16:59. The following are five workouts that will set yourself up for a fast 5K. Remember to begin each workout with a warm-up consisting of 10-15 minutes of very easy running. Include a few minutes for dynamic drills, stretches, activation and strides. Following the workout, cool down with 5-15 minutes of easy running.